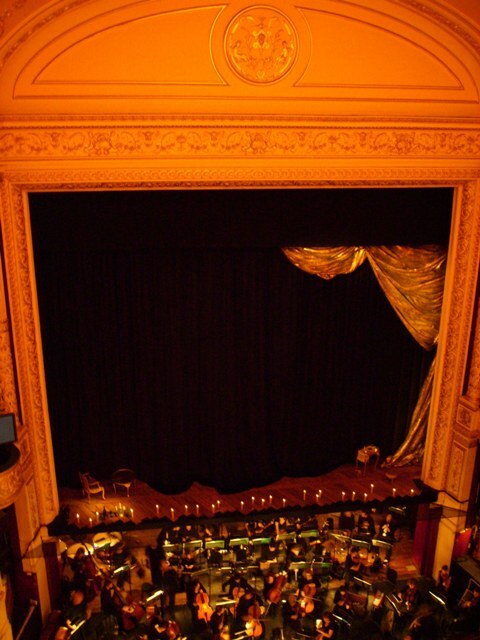 This Saturday I went to the opera to see Der Rosenkavalier by Richard Strauss. It's part of our Opera course and we only had to pay seven quid, instead of I-don't-know-how-much. So it was agreeable although he's not one of my favourite composers. It was a nice experience still, don't think I've ever seen a live opera before... But it was hard to concentrate for three and a half hours, even though I'd brought a good deal of chocolate. Especially since we all knew exactly what was going to happen! The view was amazing though, we were on the top balcony more than ten meters above the stage. And the balcony was quite steep, so you felt a bit dizzy getting to your seat. Apparently you're not allowed to take pictures at an opera performance (why?) but I managed to get a few off before it started. It really is a nice opera house! Oh! I forgot to tell you, when I came home from Sounds of Sweden the other night a saw a fox strolling down my street as I looked out the window. I've only ever seen a fox once before, if you don't count the zoo (not sure they have foxes at the zoo though...) and that was in a city as well. Maybe they've jumped on the urbanisation bandwagon too? Anyway, I was inside so I didn't get a chance to talk to him, or her. I've always wanted a fox! Not to own it mind you, just as a friend. I didn't have time to capture it on film, but it seemed almost like a magical moment, not meant to documented. And then two nights ago I spotted the fox again! This time scurrying along, as if it had a really pressing appointment. I assume it is the same one. Maybe he, or her, lives in our garden?! I should leave a cup-cake or something and then come back to check if someone's eaten it. I wonder was a fox's favourite meal is? Apart from rabbits - I couldn't kill such cuddly creatures, not even for my fox. I've only once seen a wild fox before and that was in... Glasgow! The one time I was there, actually. I think they're pretty common in UK towns, but still cool, isn't it? I've never been to an opera though.